These Signatures just CHANGED America! Mainstream media is trying to ignore this. — But it’s still rumbling across America. Cope Reynolds on the command hill addressing the patriots. I counted the days. Because I was right at the center of it as 12/13/14 dawned cold and foggy in Olympia. We had refused to apply for a permit to gather at the Capita and we stepped into the morning air with a little uncertainly and too little sleep. After a month of planning, history would be made today and we the people would nullify unconstitutional gun legislation in a manner America had only talked about. The outcome could mean great victory, or revolution. I felt a heavy weight on my shoulders, thinking of that April morning in 1775 on Lexington green. It was not my day, it was all of ours. It came from the effort of a dedicated few who refused to back down and from many who stood with us. People like Kit, Anthony, Maria, Sondra, Nathan and others. — But not all who called themselves patriots stood, some that should have been first in line, opposed the stand. We forged on. I’m reminded that we were taught to pray for good leaders. Perhaps we failed to realize was that sometimes you have to step up and become those leaders. That’s what these patriots did. They came from far and wide to set a an example and showed America how to stand principled for liberty. 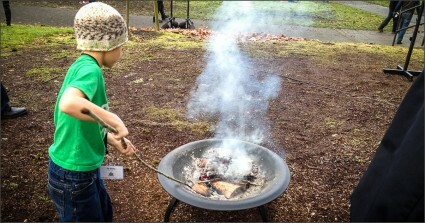 Out younger patriots keeping the fire ready for the BURNING of the gun permits. 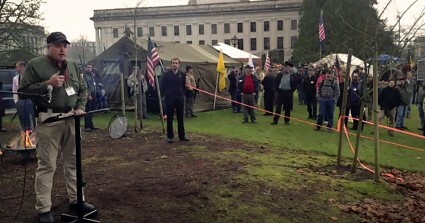 As the day rose, figures emerged from the fog onto the green, carrying flags, guns and courage. They carried their pride, their hope and their children in their arms. They came to stand in defiance of tyranny. The State capital tried to hold us back that morning by making it hard to get gear and resources in. But we stood our ground and they backed down. The officers ultimately standing with liberty, and recognizing that today was not a day for negotiations, but for the upholding of oaths. The patriots stood on the green, armed and ready. Militia and mothers, fathers and children. Old and young. Some could not be there, but stood with us in prayer and support. America stood in defiance, not only of this legislation, but of lawless government. It was a picture of history unfolding on the soggy green. One thousand, two thousand, more. It was not a protest. It was a rebellion. A Revolution of hearts that made mainstream media and false patriots gasp. But they could not stop the message, for this day the patriots said “We Will Not Comply” and they set a standard for what it means to stand. We burned carry permits, we bought and sold guns in defiance of this new legislation. We did not ask for liberty. We demanded that it be respected and we begin the long march to take back America. For me 12 13 14 was a blur of red, white, blue and beauty; despite a foggy colorless day. I remember standing on the hill, wondering if there was tyranny waiting beyond the mist, or a snipers bullet aimed at my heart. I didn’t even realize I had a security detail following my every move. I dismissed the fears, remembering those twelve legions of angels waiting in the wings, just in case. Today was a day of liberty, come what may. Light the fires of liberty, wear firm resolve on your sleeve. A great march has begun, like a sea of impenetrable ice cracked, a shot heard round the world. We will not strike the first blow, nor fire the first shot. We will keep moving to restore law and stand our ground to protect our families. The fine patriots stand against all enemies who would violate liberty, foreign or domestic. So on that misty green, chilled with dampness, we stood united. This was what America really looks like. We nullified i594 and we continue to do so each day. But even more important, we started an idea, one of bold liberty and from it a Declaration of liberty, signed by hundreds. This firm declaration flies in the face of every shred of modern neutered education and cries liberty from the rooftops! It was like nothing seen since 1776 and as I watched those patriots line up by hundreds to sign, some wept for the liberty that has been lost and my heart swelled with pride. We step onto the green knowing that America has failed and sinned. So we kneel in an appeal to heaven and for the rectitude of our intentions. Then we stand boldly, facing the wind and the tyrants whip. Preparing not to be beaten, but to tear it from their filthy hands. 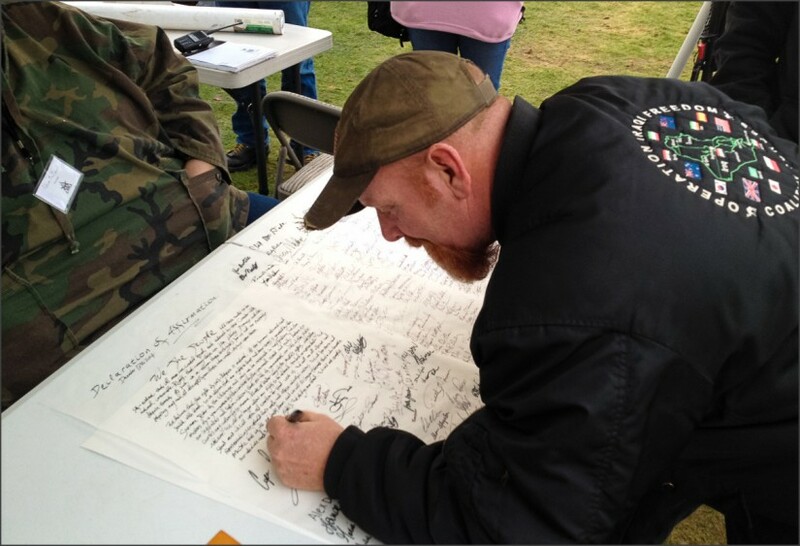 Anthony Bosworth along with hundreds of others sign the Declaration of Affirmation. It will be opened soon for online signing.